The quasi-monoclonal mouse has limited B cell diversity, whose major (∼80%) B cell Ag receptors are comprised of the knockin VH 17.2.25 (VHT)-encoded H chain and the λ1 or λ2 L chain, thereby being specific for 4-hydroxy-3-nitrophenylacetyl. The p-nitrophenylacetyl (pNP) was found to be a low affinity analog of nitrophenylacetyl. We examined affinity maturation of anti-pNP IgG by analyzing mAbs obtained from quasi-monoclonal mice that were immunized with this low affinity Ag. The results are: 1) Although VHT/λ1 and VHT/λ2 IgM were equally produced, VHT/λ2 IgG almost exclusively underwent affinity maturation toward pNP. 2) A common mutation in complementarity-determining region 3 of VHT (T313A) mainly contributed to generating the specificity for pNP. 3) Because mutated VHT-encoded γ-chains could form λ1-bearing IgG in Chinese hamster ovary cells, apparent absence of VHT/λ1 anti-pNP IgG may not be due to the incompatibility between the γ-chains and the λ1-chain, but may be explained by the fact that VHT/λ1 B cells showed 50- to 100-fold lower affinity for pNP than VHT/λ2 B cells. 4) Interestingly, a pNP-specific IgM mAb that shared common mutations including T313A with high affinity anti-pNP IgG was isolated, suggesting that a part of hypermutation coupled with positive selection can occur before isotype switching. Thus, even weak B cell receptor engagement can elicit an IgM response, whereas only B cells that received signals stronger than a threshold may be committed to an affinity maturation process. When the peripheral lymphoid tissues are exposed to an Ag, several groups of B cells are clonally selected, and differentiate into plasma or memory cells. One characteristic feature of a T cell-dependent Ab response is that the isotype of the produced Abs is switched from IgM to other classes, including IgG with time after immunization. The other is a gradual increase of Ab affinity to an inducing Ag particularly in the switched isotypes, a process termed affinity maturation (1, 2, 3, 4, 5, 6). It has been shown that isotype switching and affinity maturation are strongly dependent on germinal centers (GC)4 that are transiently formed from Ag-stimulated B and T cells in the follicular region of secondary lymphoid tissues (1, 2, 6). A series of previous reports have revealed that affinity maturation of an Ab is the result of somatic hypermutation of V region genes coupled with the positive selection of B cells (centroblasts) whose mutated B cell Ag receptors (BCR) acquire higher affinity, while B cells that failed to improve their BCR may be deleted (1, 2, 7, 8, 9). It has been shown that mutated BCR are tested for their quality in terms of affinity to the inducing Ag that are trapped in the form of immune complexes onto follicular dendritic cells in GC (1, 10, 11). B cells with improved affinity are considered to receive survival signals via their BCR and the complement receptors (CD21/CD35) and from CD4+ T cells (1, 12, 13), thus leading to the retention of B cells that will subsequently secrete higher affinity Abs. In wild-type mice, somatic hypermutation and affinity maturation have been systematically investigated in Ab responses to several haptens, including 2-phenyl-5-oxazolone (14, 15) and 4-hydroxy-3-nitrophenylacetyl (NP) (16, 17, 18, 19, 20), because limited Ig genes are preferentially used in these Ab responses, VHOx1/VκOx1 in the former response, and VH 186.2 in the latter, respectively. However, it has not been fully elucidated how an Ag-stimulated B cell clone becomes a winner in the competition with others, and what criteria direct B cells to enter affinity maturation pathway. To examine these issues, we used the quasi-monoclonal (QM) mouse with limited BCR diversity, in which one of the JH loci is replaced with the 17.2.25 VHDJH segment (VHT) derived from an anti-NP mAb (21), with the other JH locus and both κ loci being disrupted (22). The advantage of this type of knockin strain is that the site-directed VH-encoded (VHT+) H chain has been shown to undergo class switching and somatic mutation normally (23, 24). However, it has not been fully analyzed how a site-directed V gene is tuned during affinity maturation. Approximately 80% of QM B cells expressed VHT+ NP-specific BCR that bear λ-chains (21, 22), of which λ1- and λ2-chains were major L chains used. By stimulating B cells with NP analogs of varying affinity, this mouse will enable us to examine how the B cell differentiation into plasma or memory cells is regulated by the intensity of BCR engagement. We tested various NP analogs, and found that p-nitrophenylacetyl (pNP) showed at least ∼20-fold lower affinity than NP for VHT+ QM B cells (25). In the present study, using QM mice that were immunized with pNP-conjugated chicken γ-globulin (CGG), we examined affinity maturation of anti-pNP IgG in the following two respects: 1) How do originally NP-specific B cells acquire pNP specificity by somatic hypermutation during affinity maturation toward pNP? 2) How are two major B cell clones, VHT/λ1 and VHT/λ2, selected by pNP to be committed to affinity maturation process? NP, pNP, 4-hydroxy-5-iodo-3-nitrophenylacetyl (NIP), 4-hydroxy-phenylacetyl, and m-nitrophenylacetyl were purchased as the free acids from Tokyo Kasei (Tokyo, Japan). NP, NIP, or pNP was conjugated to CGG (Sigma-Aldrich, St. Louis, MO) or BSA by reacting the N-hydroxysuccinimide ester of each acid, as described previously (25). Usually, CGG was conjugated with ∼25 molecules of each hapten. An appropriately diluted anti-pNP IgM Ab purified from a QM mouse serum was added at 50 μl to 96-well microplates (Nunc, Roskilde, Denmark) that were coated with rabbit anti-mouse IgM (Funakoshi Chemicals, Tokyo, Japan). After incubation for 2 h at 25°C, followed by washing, 50 μl of PBS containing 10 μg/ml NP-conjugated β-galactosidase (β-Gal) (∼3 NP/enzyme molecule) and varying concentrations of a free hapten were added in each well. NP-β-Gal was prepared by reacting Escherichia coli β-Gal (Sigma-Aldrich) with N-hydroxysuccinimide ester of NP in the same fashion as described previously (26). The plate was incubated for 1 h at 25°C, followed by washing thoroughly. PBS containing 0.1% BSA was used for diluting reagents and washing. The bound NP-β-Gal activity was assayed by adding a fluorescent substrate, 4-methylumbelliferyl-β-d-galactoside (Sigma-Aldrich), as reported previously (27). The affinity of each hapten for the anti-NP IgM was estimated by measuring the free hapten concentration that is required for 50% inhibition of the binding of NP-β-Gal to the solid phase. B cells were stained with anti-mouse Abs in PBS containing 0.2% BSA, 0.1% sodium azide, and, when necessary, 50 μg/ml of normal rat IgG (ICN Pharmaceuticals, Costa Mesa, CA). FITC or CyChrome anti-B220 (RA3-6B2), PE anti-CD138 (281-2), biotinylated anti-λ1 L chain (R11-153), and biotinylated anti-λ2 L chain (2B6) that was cross-reactive with λ3 were purchased from BD PharMingen (San Diego, CA). B cells bearing VHT-encoded IgH were detected with biotinylated mAb to the Id of VHT, R2.438 (a gift from T. Imanishi-Kari, Tufts University, Boston, MA). Surface IgM (sIgM) was detected using PE anti-IgM (Southern Biotechnology Associates, Birmingham, AL). Biotinylated Abs were visualized with FITC- or PE-labeled streptavidin. Stained cells were analyzed with FACSCalibur and CellQuest software (BD Biosciences, Mountain View, CA). The quasi-monoclonal (QM) mouse is a gene-targeted strain whose genotype is VHT/JH−, Jκ−/Jκ−, λ+/λ+ (22). QM mice were immunized in the hind footpad with 20 μg of pNP25-CGG emulsified in CFA, and bled on indicated days after immunization. All mice were treated in accordance with the guidelines approved by the Committee of Laboratory Animal Care, Okayama University. In the induction of an Ab response in vitro, QM spleen B cells (3 × 106), prepared as described (27), were cultured with 3 × 104 CGG-specific Th2 clone, CTH, which was established in our laboratory, in the presence of varying concentrations of NIP-CGG or pNP-CGG in 1 ml of RPMI 1640 medium supplemented with 10% FCS and 1 × 10−5 M 2-ME. On day 3 of the culture, the cells were washed to remove free Ags, and cultured for an additional 3 days. Culture supernatants were assayed for VHT Id+ IgM Abs by a sandwich ELISA using R2.438 anti-Id and anti-μ Abs. Data were presented as the mean values of triplicate experiments. SEs do not usually exceed 10% of the mean. For observing down-regulation of sIgM, QM B cells (3 × 106/ml) were cultured with 1 μg/ml of pNP-CGG or NIP-CGG for 3 h. B220+Id+ B cells were assessed for the level of sIgM by flow cytometry. ELISA for anti-pNP Abs was performed using 96-well microplates coated with pNP20-BSA (a high hapten density) to detect both high and low affinity anti-pNP Abs. Each class of Abs bound to the plates was measured with peroxidase-conjugated goat IgG specific for mouse IgM (Southern Biotechnology Associates) or peroxidase-conjugated horse Abs to mouse IgG (Vector Laboratories, Burlingame, CA), respectively. IgG1 and IgG2b were major subclasses in the anti-pNP response. Usually, IgG was assayed without discriminating subclasses in the present experiments. Relative affinity of anti-pNP IgG in serum samples or mAbs was estimated by differential binding of the Ab to plates coated with pNP4-BSA (a low hapten density) and pNP20-BSA (a high hapten density), and expressed as the ratio of IgG bound to pNP4/IgG bound to pNP20 (sometimes abbreviated as pNP4-pNP20), as reported previously (25, 28). As the positive control for the affinity assay, an anti-pNP IgG mAb (pNP4-pNP20 = 0.7) was used as a standard sample. To compare the affinities of VHT/λ1 and VHT/λ2 IgM mAbs for pNP and NP, a displacement ELISA was conducted (29). Briefly, 1 μg/ml of each mAb was incubated for 3 h at room temperature in microplates coated with pNP20-BSA or NP7-BSA. After washing, the bound mAb was incubated for 1 h with varying concentrations of NP-ε-aminocaproate. The displacement of the bound mAb by the free hapten was estimated by determining the residual mAb on the plates. An appropriately diluted mAb was added to microplates that were coated with pNP-BSA, NP-BSA, or NIP-BSA (6–7 each hapten/BSA molecule), and incubated at 25°C for 1 h. After washing, bound mAb was assayed by reacting peroxidase-conjugated second Abs, as described above. On day 16 after immunization of QM mice with pNP-CGG/CFA in the footpads, popliteal lymph node (LN) cells were prepared and fused with a myeloma cell line, NSObcl-2 (30), which was given by B. Diamond (Albert Einstein College of Medicine, New York, NY). mAbs were screened on the basis of binding to pNP20-BSA. The retention of VHT and the usage of λ-chains in the mAbs were examined by ELISA using anti-VHT Id, anti-λ1, and anti-λ2 mAbs, and further confirmed by RT-PCR using specific primers, as described previously (31, 32). Hybridomas secreting nonmutated VHT/λ1 IgM, VHT/λ2 IgM, or VHT/λ2 IgG1 mAb were generated by the cell fusion with NSObcl-2 of QM B cells that were stimulated in vitro for 5 days with 20 μg/ml of LPS from E. coli (Sigma-Aldrich) in the presence or absence of 10 ng/ml of IL-4 (PeproTech EC, London, U.K.). The absence of somatic mutations in the VHT+ mAbs was confirmed by sequencing VH and VL genes. cDNA was synthesized from total RNA of each anti-pNP mAb-secreting hybridoma, as described previously (25). VH and VL regions of mAbs were amplified with PCR using AmpliTaq Gold DNA polymerase (Applied Biosystems, Foster City, CA). Primers used were as follows. For amplifying VH regions, CTGAATCTCAAGGTCCTTAC specific for VHT, and ARCTKSWGSAGWCWGGRSSWG and ARCTKAWGSAGWCWGGRSSWG for endogenous VH as sense primers; GACAGGGMTCCAKAGTTCCA for all IgG subclasses, and GTTCTGATACCCTGGATGACTTC for IgM as antisense primers. For amplifying Vλ regions, GCTGCTGACCAATATTGAAAAGAATAGACC and GCATGTTTCTGATCTCAGCCTCTG for the λ1-chain; GCTGCTGACCAATATTGAAAATAATAGACT and TCCCAGGCTAAGGAGAAACCTG for the λ2-chain. Amplified fragments were purified with QIAquick Gel Extraction Kit (Qiagen, Hilden, Germany) and directly sequenced using BigDye Terminator Cycle Sequencing FS Ready Kit equipped with ABI PRISM 310 Genetic Analyzer (Applied Biosystems). The BLAST (http://www.ncbi.nlm.nih.gov/BLAST/) and the IgBLAST (http://www.ncbi.nlm.nih.gov/igblast/) programs were used to find the closest matching sequences in the nonredundant database at the National Center for Biotechnology Information server, and the Seqhunt II (http://immuno.bme.nwu.edu/seqhunt.html) was used to search the Kabat database (33). Various combinations of germline or mutated VHT-encoded H chain with the λ1- or λ2-chain derived from VHT+ mAbs were expressed as recombinant Abs in CHO cells. CHO cells were maintained in RPMI 1640 medium suplemented with 10% FCS, 1 × 10−5 M 2-ME, 100 U/ml penicillin G, and 50 μg/ml streptomycin. 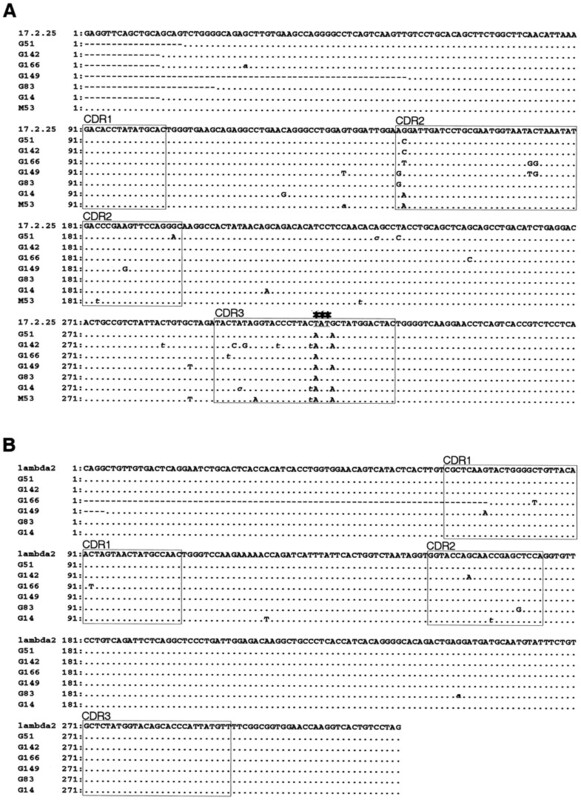 VHT regions from mAbs, VHT/λ2 IgM, G83, and G149, were amplified using Pfu DNA polymerase (Stratagene, La Jolla, CA) and primers, TCAAGCTAGCCACCATGAAATGCAGCTGGGTTATC and TTTTAGCGCTCGAGACGGTGACTGAGGTTCC, followed by the digestion of the products with NheI and Eco47III. The IgG2b C region was amplified with CCGTCTCGAGCGCTAAAACAACACCCCCATCAGTC and CTTTGCGGCCGCTGAGCTCATTTACCCGGAGA, and the product was digested with Eco47III and NotI. The digested VH fragments derived from VHT/λ2 IgM, G83, and G149 were each inserted in combination with the fragment of the γ2b C region between NheI and NotI sites of a mammalian expression vector, pCI-neo (Promega, Madison, WI), which were designated as pCIGVHT, pCIG83, and pCIG149, respectively. Another two constructs bearing the γ2b genes containing only one (T313A) or two (T313A/G316A) mutations in VH complementarity-determining region 3 (CDR3) were constructed by replacing a KpnI-Eco47III fragment of pCIGVHT with the corresponding sequence from pCIG83 or pCIG149, respectively. A PvuII-BamHI fragment containing neomycin phosphotransferase gene of pCI-neo was exchanged with a PvuII-BamHI fragment containing puromycin N-acetyltransferase gene of pBSpacDp (34). This expression vector was termed as pCI-puro. The λ1- and λ2-chains were amplified from VHT/λ1 IgM and VHT/λ2 IgM hybridomas using ACCTGTCGACGCCACCATGGCCTGGATTTCACTTATAC as a sense primer for both λ1 and λ2, and GGAAGCGGCCGCTCACCTAGGAACAGTCAGCAC and GGAGCGGCCGCGGTTCTTAGAGACATTCTGCAGGAG as antisense primers for λ1 and λ2, respectively. The λ1 and λ2 fragments were digested with SalI and NotI, and cloned into pCI-puro. Sequence analysis of all the gene constructs confirmed that no mutation was introduced during PCR amplification. The IgG2b C region and the λ1- and λ2-chains had germline sequences. All constructs were linearized by digesting with BamHI or BglII before transfection. CHO cells were transfected with an appropriate combination of a γ2b and a λ gene using LipofectAmine (Life Technologies, Rockville, MD). Stable transfectants were selected and maintained in the presence of 500 μg/ml G418 and 5 μg/ml puromycin (Sigma-Aldrich). The VHDJH gene segment, VHT, is derived from 17.2.25 anti-NP mAb (γ1, λ) that binds to NP and its iodinated analog NIP. The affinity (Ka) of 17.2.25 for NIP has been estimated to be 4 × 105 M−1 (21). In QM mice bearing the site-directed VHT with the genotype of VHT/JH−, κ−/κ−, λ+/λ+, a majority (∼80%) of B cells expressed VHT-encoded BCR that were detected by an anti-Id mAb, R2.438 (35) (Fig. 1⇓A). Because both κ loci are disrupted, QM B cells exclusively express λ-chains (22). Although an anti-λ2 mAb used in the flow cytometric analysis has cross-reactivity with λ3, of ∼30 λ-chains randomly sequenced, λ1 and λ2, but not λ3, were found (data not shown), thus suggesting that the λ1- and λ2-chains are major L chains used. 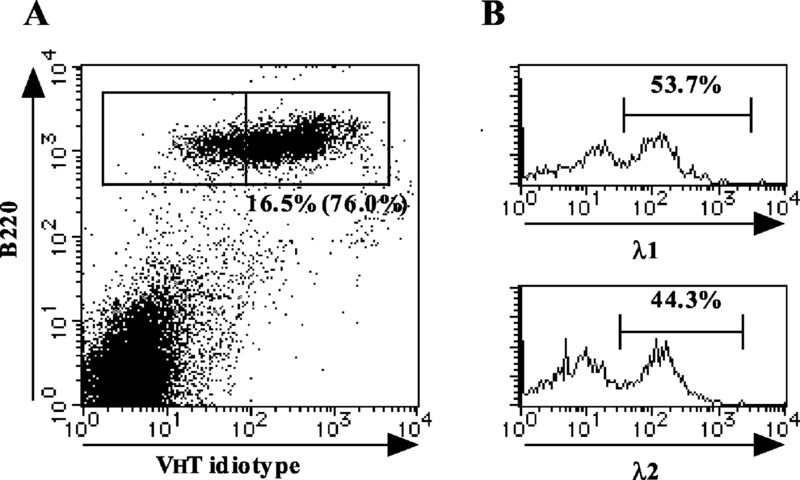 Flow cytometric analysis shows that each VHT/λ1 and VHT/λ2 B cell population has a comparable size (Fig. 1⇓B). Both VHT/λ1 and VHT/λ2 Abs have been shown to bind to NP (21, 22). To examine various NP-related haptens for their binding activity to VHT+ anti-NP IgM derived from QM mice, free hapten inhibition of the binding of NP-conjugated β-Gal to the immobilized anti-NP IgM was assessed. We found that pNP had ∼20-fold lower affinity than NP (Fig. 2⇓A). pNP has not been tested as a NP analog by other investigators. In contrast, m-nitrophenylacetyl showed a comparable affinity to NP, while NIP bound to the anti-NP Ab more strongly than NP, as observed in various anti-NP mAbs (21, 35). The 4-hydroxyphenylacetyl showed no significant binding. Thus, stimulation of QM B cells with haptens of varying affinity will provide useful means to analyze the correlation between the intensity of BCR engagement and subsequent B cell differentiation. Flow cytometric analysis of BCR expressed on peripheral B cells of QM mice. A, LN B220+ B cells were examined for the expression of VHT+ BCR. The percentage of VHT Id+ cells in B220+ B cells (16.5% of total LN cells) is indicated in the parentheses. B, The percentage of λ1+ or λ2+ cells among B220+Id+-gated cells. Data are the representative of three measurements. A, Estimation of relative affinity of NP-related haptens for VHT+ BCR of QM B cells. pNP is a low affinity analog of NP. NP-β-Gal was incubated in the microplates coated with anti-NP IgM purified from a QM mouse serum in the presence of varying concentrations of each hapten. Affinity of each hapten for VHT+ BCR was estimated by measuring the free hapten inhibition of binding of NP-β-Gal to anti-NP IgM. IC50 of each hapten is shown. Relative affinity of each hapten was calculated as the reciprocal of IC50 and shown in the parentheses, in which the value of NP is designated as 1. B, Comparison of the potency to down-regulate sIgM on QM B cells between NIP-CGG and pNP-CGG. After incubation of spleen B cells with 1 μg/ml NIP25-CGG or pNP25-CGG for 3 h, B220+-gated cells were analyzed for the expression of sIgM by flow cytometry. Thick and thin diagrams represent NIP- or pNP-CGG-treated B cells and mock-treated B cells, respectively. Representative data from four repeated experiments are shown. C, Induction of IgM Ab response in QM B cells in vitro. The spleen B cells were cocultured in triplicate with CGG-specific Th2 cells in the presence of varying concentrations of pNP-CGG (•) or NIP-CGG (○). VHT Id+ IgM levels in the culture supernatants were assayed. Data are the representative of five repeated experiments. In the present work, QM mice were immunized with NP analogs that were conjugated to CGG. To confirm that pNP acts as a low affinity ligand to QM BCR, we compared pNP-CGG and NIP-CGG for the triggering activity of QM B cells by assessing down-regulation of sIgM by these hapten carriers. sIgM was strongly down-regulated after incubation of the splenic B cells with 1 μg/ml of NIP-CGG for 3 h, but to a much lesser extent with the same concentration of pNP-CGG (Fig. 2⇑B). The down-regulating effects were dose dependent, and similar results were obtained when the incubation was prolonged up to 24 h (data not shown). In contrast, QM B cells were cultured in vitro with CGG-specific Th2 cells in the presence of varying concentrations of pNP-CGG or NIP-CGG. Consistent with the affinity of each Ag for QM BCR, NIP-CGG induced VHT Id+ IgM at lower concentrations (0.01–0.1 μg/ml) than pNP-CGG, which elicited the Ab response significantly at greater than 1 μg/ml (Fig. 2⇑C). CGG without haptens did not induce the Ab response at 0.01–10 μg/ml (data not shown). These observations suggest that pNP behaves as a low affinity ligand for QM BCR in the form of CGG conjugate. In addition, pNP was able to elicit the hapten-specific VHT+ IgG response efficiently in QM mice, as shown in the following section. These observations led us to investigate how VHT/λ1 and VHT/λ2 B cells that are originally specific for NP or NIP are triggered by pNP and undergo affinity maturation toward this low affinity hapten, and how the site-directed VHT is modified during the affinity maturation process. 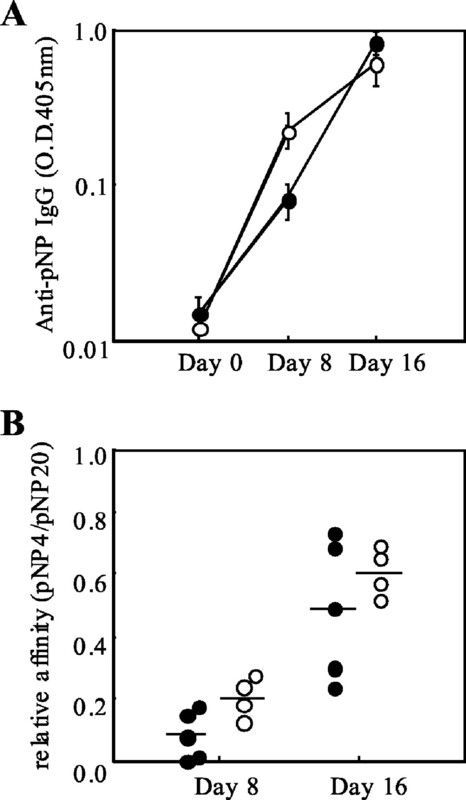 When QM mice were immunized with pNP-CGG in the footpad, serum anti-pNP IgG Abs that were negligible on day 0 increased appreciably from day 8 to 16 after immunization (Fig. 3⇓A). Anti-pNP IgM titer was apparently high in the preimmune serum because VHT+ anti-NP IgM Abs that are spontaneously present at a high level showed cross-reactivity with pNP, but was further increased after immunization (data not shown). Concomitant with an increase in anti-pNP IgG titer, there was a significant increase in the affinity of IgG Abs to pNP that was assessed by the ratio of the Ab binding to the low density hapten (pNP4-BSA) to the binding to the high density counterpart (pNP20-BSA) (Fig. 3⇓B). The ratio (pNP4-pNP20) increased from ∼0.1 on day 8 to ∼0.6 on day 16, indicating that affinity maturation coupled with isotype switching occurred in this knockin strain. A, Anti-pNP IgG response in QM mice immunized with pNP-CGG. QM mice (n = 4–5) were immunized in the footpad with pNP-CGG/CFA, and bled on indicated days. B, Affinity maturation of anti-pNP IgG. Sera collected on days 8 and 16 after immunization were assessed for the relative affinity of anti-pNP IgG Abs by measuring the ratio, the amount of IgG bound to pNP4-BSA/the amount of IgG bound to pNP20-BSA (pNP4-pNP20). In each panel, ○ and • indicate two separate experiments. To investigate how VHT+λ+ Abs that were originally specific for NP underwent affinity maturation toward pNP by altering their Ag specificity, B cell hybridomas were generated from the draining LN cells on day 16 after immunization. Among 150 clones that secreted pNP-reactive IgG mAbs, 15 high affinity clones (pNP4-pNP20 > 0.7) were selected, of which 8 clones were VHT+, and the rest were found to use endogenous VH genes that are considered to be generated by the replacement of the VH portion of VHT with upstream endogenous VH or VHD, as reported previously (22, 36, 37) (Table I⇓). VH and VL gene usage was examined by ELISA and/or RT-PCR. A characteristic feature is that all the VHT+ anti-pNP IgG mAbs examined used λ2 as the L chain, while both λ1 and λ2 were used in VHT− anti-pNP IgG mAbs (Table I⇓). In contrast, all pNP-reactive IgM mAbs examined were VHT+, and used either λ1 or λ2 L chains (Table I⇓), suggesting that both VHT/λ1 and VHT/λ2 B cells were activated in response to pNP to differentiate into IgM producers. More direct evidence is presented in the later section. Ag specificity of these mAbs was analyzed by ELISA. The control unmutated VHT+ IgM and IgG1 mAbs were generated by the cell fusion of QM B cells that were stimulated in vitro with LPS in the presence or absence of IL-4. Nucleotide sequences of VH and VL genes in these mAbs were read to confirm the absence of somatic mutations (data not shown). Unmutated VHT/λ2 IgM and IgG1 mAbs thus obtained showed an Ag specificity (NIP > NP > pNP) that is similar to those reported previously (21, 35) (Fig. 4⇓). In contrast, all of the high affinity VHT+ anti-pNP IgG mAbs, six of which were shown as representatives (Fig. 4⇓), acquired higher specificity for pNP (pNP > NP > NIP). Similar pNP specificity was observed in VHT− IgG mAbs listed in Table I⇑ (data not shown). Ag specificity of anti-pNP IgG or IgM mAbs obtained from pNP-CGG-immunized QM mice. The Ag specificity was assessed by measuring the binding of an appropriately diluted mAb to microplates coated with pNP-, NP-, or NIP-BSA. As the control, the Ag specificity of unmutated VHT/λ2 IgM or VHT/λ2 IgG1 mAb is shown. Data are presented as relative binding to each hapten, in which the highest value in each mAb is expressed as 100. Anti-pNP IgG mAbs shown here exhibit high affinity for pNP (pNP4-pNP20 > 0.7). All mAbs listed in Table I⇑ were examined, and results from representative clones are presented. 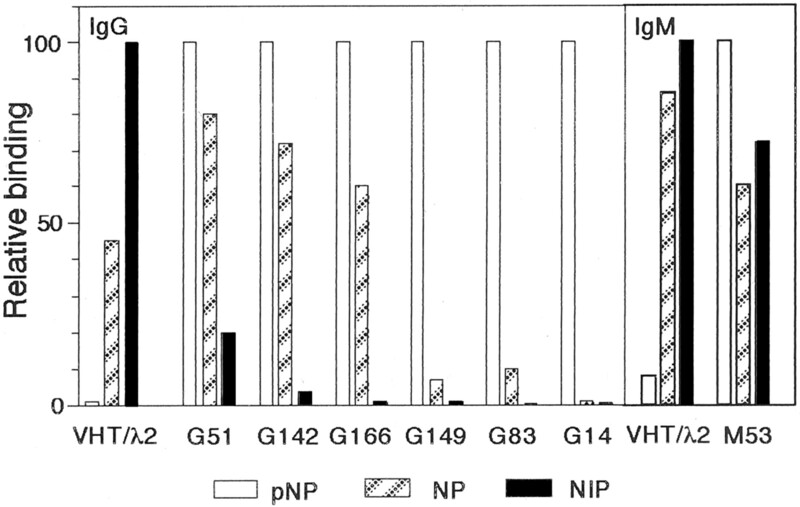 Most VHT/λ1 or VHT/λ2 IgM mAbs shown in Table I⇑ had similar Ag specificity (NIP > NP > pNP) to that of the unmutated VHT/λ2 IgM (data not shown). One exception is a VHT/λ2 clone, M53, that showed increased pNP specificity as VHT+ anti-pNP IgG mAbs (Fig. 4⇑). Taken together, it is shown that VHT/λ2 B cells, but not VHT/λ1 B cells, preferentially underwent affinity maturation toward pNP in response to pNP-CGG, while the IgM Ab response occurred comparably in VHT/λ1 and VHT/λ2 B cells. Following analyses were done to examine why the biased use of the λ2-chain in anti-pNP IgG was brought about. To identify somatic mutations that led to the change of Ag specificity from NP to pNP, nucleotide sequences of the VH and VL genes in VHT+ anti-pNP IgG mAbs listed in Table I⇑ were analyzed. Data from six representative clones are shown (Fig. 5⇓A). There was a unanimously shared point mutation (T to A) at position 313 (T313A), which resulted in the replacement of Tyr105 with Asn. An additional mutation (G to A) at position 316 (G316A) that caused the change of Ala106 to Thr was found in four of six IgG clones (Fig. 5⇓A). There were one to three point mutations in the λ2-chain of each IgG clone, but no common replacement mutation was found (Fig. 5⇓B). Nucleotide sequences of the VHT and Vλ2 genes in anti-pNP mAbs. A, VHT nucleotide sequences in anti-pNP mAbs. Results from six IgG clones (G51, 142, 166, 149, 83, and 14) and one IgM clone (M53) listed in Table I⇑ are shown as representatives. Dots indicate sequence identity with unmutated VHT (17.2.25). Capital and small letters indicate amino acid replacement mutations and silent mutations, respectively. Asterisks at position 313–315 show a unanimous replacement mutation (Tyr to Asn) in these anti-pNP mAbs. IgM clones other than M53 that are shown in Table I⇑ have no somatic mutation in VHT (data not shown). B, Vλ2 nucleotide sequences of the VHT+ anti-pNP IgG mAbs shown in A. All IgM mAbs that were obtained from pNP-CGG-immunized mice had VHT+ μ-chains, which were associated with λ1- or λ2-chain (Table I⇑). Consistent with their retention of the specificity for NP (Fig. 4⇑), we confirmed that all the IgM mAbs except M53 had no point mutation in either chain (data not shown). VHT+ μ-chain of M53 had a point mutation, T313A, that was shared by all VHT+ anti-pNP IgG mAbs (Fig. 5⇑A), while there was no mutation in its λ2 gene (data not shown). Because M53 bound to pNP more efficiently than NP (Fig. 4⇑), the T313A mutation is considered to be crucial for generating the pNP specificity. The occurrence of common mutations in IgM and IgG mAbs that are responsible for the affinity maturation is interesting because hypermutation and isotype switching generally have been reported to occur in a coordinated fashion (3, 7, 8). A pivotal role of the T313A mutation played in the acquisition of pNP specificity was further confirmed by the following transfection experiments. 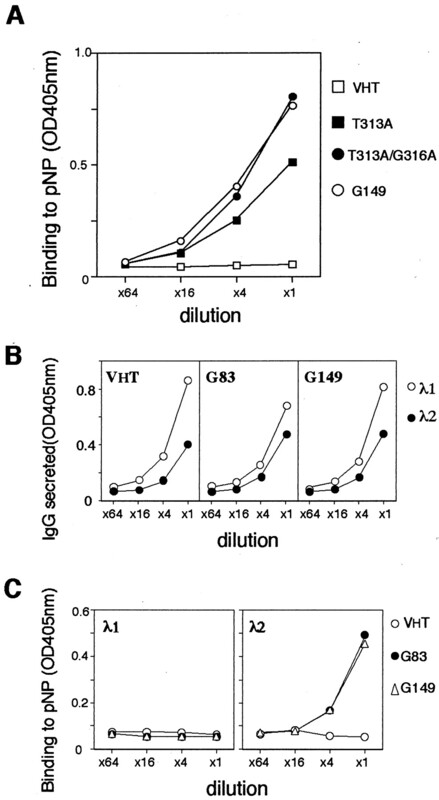 When the VHT+ γ2b chain possessing only T313A mutation was expressed in association with the λ2-chain in CHO cells, the resultant IgG2b showed an increase in the binding to pNP compared with the native VHT-encoded γ2b (Fig. 6⇓A). When another mutation, G316A, was introduced in addition to T313A, pNP binding of the secreted IgG2b further increased to the level that was comparable to that observed in a high affinity anti-pNP IgG2b clone, G149, suggesting that these point mutations play a critical role in the affinity maturation toward pNP. Expression of recombinant IgG Abs in CHO cells. A, Contribution of mutations T313A and G316A in CDR3 of VHT+ γ2b to an increase in pNP specificity. VHT+ γ2b bearing none, T313A only, or G316A in addition to T313A (G316A/T313A) was each expressed together with λ2 in CHO cells. As the control, γ2b from G149 anti-pNP IgG2b mAb (see Table I⇑) and native VHT+ γ2b were expressed. Binding of secreted IgG to pNP was assayed by ELISA in appropriately diluted culture supernatants. B, Mutated VHT+ γ2b chains from G83 and G149 anti-pNP mAbs can associate with the λ1-chain. The mutated VHT+ γ2b gene derived from the clones, G83 or G149, was expressed together with the native λ1 or λ2 gene in CHO cells. As the positive control, native VHT-encoded γ2b was expressed. IgG secretion was measured by a sandwich ELISA using anti-IgG and anti-λ1 or anti-λ2. C, The λ2-, but not the λ1-chain forms pNP-specific IgG2b when expressed together with mutated VHT+ γ2b chains derived from G83 and G149 in CHO cells. Native VHT+ γ2b was used as a negative control. Although at least 40% of high affinity anti-pNP IgG Abs used endogenous VH genes, VHT− IgM clones may be rare. The 24 IgM mAbs not listed in Table I⇑ that were obtained on day 8 or 16 after immunization with pNP-CGG were also positive for the Id of VHT (data not shown). Thus, it is suggested that VHT− B cells activated by pNP are very minor in the early phase of the immune response, but expand drastically during competition with VHT+ B cells. Because VHT+ QM B cells expressed λ1 and λ2 at comparable frequency (Fig. 1⇑B), we investigated why λ2 was predominantly used in high affinity VHT+ anti-pNP IgG. This may be due to either that VHT+ γ-chains harboring mutations that are responsible for the pNP specificity are structurally unfavorable in associating with the λ1-chain, or that there is a difference in the affinity for pNP between VHT/λ1 and VHT/λ2 B cells. To examine whether the former possibility is correct, we transfected CHO cells with the mutated VHT+ γ2b genes derived from the two representative anti-pNP IgG2b clones, G83 and G149, together with the λ1 or λ2 gene, respectively. Sandwich ELISA using anti-γ and anti-λ revealed that either γ2b chain was secreted in association with λ1 or λ2, respectively (Fig. 6⇑B), thus ruling out that there is some incompatibility between the mutated γ2b and λ1. In contrast, IgG2b comprised of these VHT+ γ2b and the λ1-chain showed much lower binding to pNP than the original λ2-associated counterpart, thus suggesting that VHT/λ1 B cells cannot improve their affinity for pNP by using the same IgH mutations as those used in VHT/λ2 anti-pNP IgG mAbs (Fig. 6⇑C). Next, we compared unmutated VHT/λ1 and VHT/λ2 IgM for their affinity for pNP to estimate the affinity of each QM BCR for the hapten. VHT/λ1 and VHT/λ2 IgM showed comparable affinity for NP, while the former is considered to bind pNP 50- to 100-fold less strongly than the latter, as assessed by the displacement of pNP-bound Abs with increasing concentrations of free NP (Fig. 7⇓, A and B). Because VHT/λ1 IgM has very low affinity for pNP, the relative affinity of pNP estimated in Fig. 2⇑A may virtually represent that of VHT/λ2. We compared the relative affinity of VHT/λ2 IgM mAb for pNP and NP with displacement ELISA, and obtained a similar result to those shown in Fig. 2⇑ (data not shown). A, Comparable binding of VHT/λ1 and VHT/λ2 IgM to NP. VHT/λ1 and VHT/λ2 IgM mAbs bound to a NP7-BSA-coated plate were incubated with varying concentrations of free NP. NP-ε-aminocaproate was used as free NP. After washing, the level of residual IgM Abs on the plate was assayed. B, Comparison of the affinity for pNP between VHT/λ1 and VHT/λ2 IgM mAbs. VHT/λ1 and VHT/λ2 IgM mAbs bound to a pNP20-BSA-coated plate were displaced by varying concentrations of free NP. In each panel, ○ and ▴ indicate VHT/λ1 IgM and VHT/λ2 IgM, respectively. As a number of hybridomas secreting VHT/λ1 IgM as well as those secreting VHT/λ2 IgM were obtained (Table I⇑), VHT/λ1 B cells with very low affinity for pNP may have been activated in response to pNP-CGG in the initial phase of the immune response. To prove this more directly, we investigated whether VHT/λ1 B cells acquire a plasma cell phenotype after immunization. On day 5 after immunization with pNP-CGG in the footpad, it was confirmed that there was a significant increase in the number of VHT+ Ab-secreting cells in the draining LN, as assessed by ELISPOT assay, 90–95% of which were IgM producers (350–500 ELISPOT/106 LN cells). The analysis of the same LN cells for the expression of CD138, a plasma cell marker, revealed that CD138+ VHT+ B cells increased significantly after immunization (Fig. 8⇓A). VHT+-gated CD138+ B cells were further analyzed for the expression of the λ1- or λ2-chain. 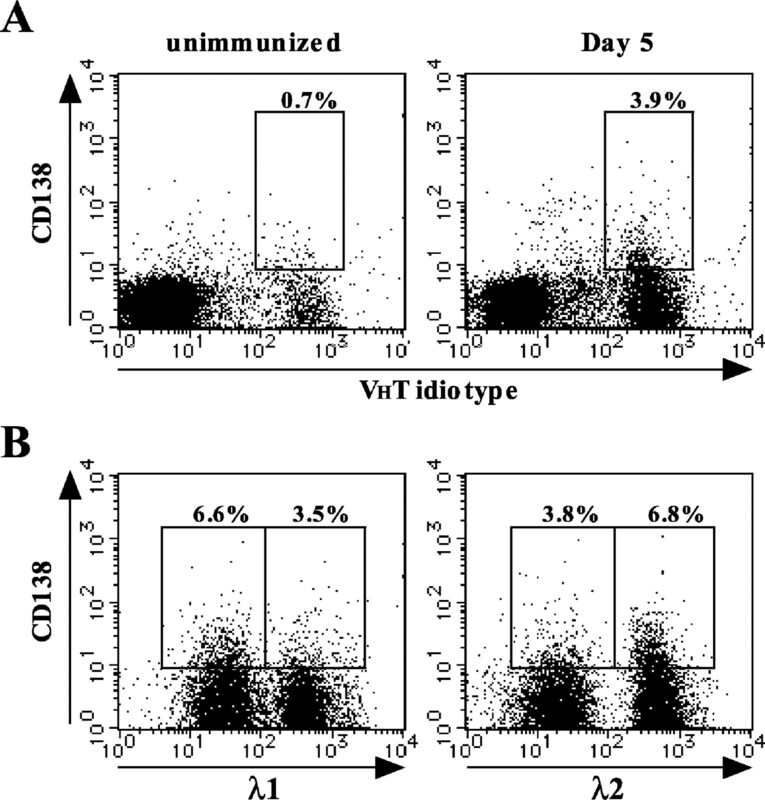 The results show that VHT/λ1 as well as VHT/λ2 B cells became CD138+ (Fig. 8⇓B). The frequency of the latter appears to be higher than the former. This might reflect the differential affinity of these two populations for pNP. Although detailed data are not presented, we further confirmed the following two points: 1) There was a ∼2-fold increase in the serum level of VHT+ IgM on day 8 after immunization with pNP-CGG, but the ratio of VHT/λ1 IgM to VHT/λ2 IgM in the preimmune sera (4:6) did not significantly change after immunization, thus suggesting that both VHT/λ1 and VHT/λ2 IgM were produced in response to pNP-CGG. 2) Approximately 40% of VHT+ IgM Abs secreted from QM B cells that were cultured with 1 μg/ml pNP-CGG- and CGG-specific Th cells (as shown in Fig. 2⇑C) were positive for λ1. All these results support that VHT/λ1 B cells as well as VHT/λ2 B cells responded to the Ag to become IgM producers. A, Detection of CD138+ B cells in the draining LN of QM mice after immunization. On day 5 after immunization with pNP-CGG in the footpad, the popliteal LN cells were analyzed for the expression of the Id of VHT and CD138. B, Id+-gated CD138+ cells from the day 5 LN cells were analyzed for the expression of the λ1 (left panel) or the λ2 (right panel) L chain. The number in each diagram represents percentage of the indicated population in the total gated cells. Taken together, pNP-immunized QM mice provide a unique system in which two major B cells with differential affinity for the hapten are triggered depending on the intensity of BCR signals. The results show that even low affinity B cells were activated to become IgM producer, but B cells that received signals stronger than a threshold may have been recruited to affinity maturation process, including somatic hypermutation, isotype switching, and positive selection. In QM mice with limited B cell diversity, we monitored how the two major B cell populations bearing NP-specific BCR, VHT/λ1 and VHT/λ2, were clonally selected and committed to affinity maturation in the immune response to a hapten pNP, a low affinity analog of NP. NP shows comparable affinity for VHT/λ1 and VHT/λ2 BCR, while pNP binds to VHT/λ2 BCR ∼20-fold less strongly than NP. In contrast, VHT/λ1 B cells have very low affinity for NP and pNP, which bind pNP 50- to 100-fold less efficiently than VHT/λ2 B cells. The QM system is considered to have the following two characteristic features. One is that, by stimulating QM B cells with pNP, it is possible to investigate how originally NP-specific B cells somatically mutate their V region genes and change the Ag specificity toward pNP during affinity maturation. The other is that one is able to analyze how differentially VHT/λ1 and VHT/λ2 B cells respond to pNP depending on the intensity of BCR signals. Because pNP preferentially induces IgG Abs bearing the λ L chain, as we reported previously (25), it is reasonable to analyze anti-pNP response in QM mice who exclusively express λ-chains (22). In consequence of affinity maturation of VHT+ anti-pNP IgG, the Ag specificity of the resultant Abs was changed to pNP > NP > NIP in contrast to that of the unmutated Abs (NIP > NP > pNP). A common point mutation, T313A in CDR3 of VHT is considered to be critical for generating the pNP specificity, although some other mutations, including G316A and those present in CDR2, may also be partly involved. The importance of the T313A mutation was confirmed by the observation that the VHT-encoded γ2b chain harboring only the T313A mutation constituted IgG2b with increased pNP specificity when it was expressed in CHO cells together with the unmutated λ2-chain (Fig. 6⇑A). An IgM mAb, M53 is unique in that it showed higher specificity for pNP than NP. This is considered to be due to the presence of the same replacement mutations as those shared by VHT+ anti-pNP IgG mAbs (Fig. 5⇑A). Somatic hypermutation and isotype switching are considered to occur in a coordinated fashion, with the latter initiating later than the onset of the former in GC (37). The mutation frequency is usually higher in the IgG classes than in the IgM class (7, 38). The link between somatic hypermutation and isotype switching has been recently explained at the molecular level by the discovery of activation-induced cytidine deaminase, a putative RNA-editing enzyme responsible for these two processes (3, 39, 40). The replacement mutations, including T313A and G316A, found in high affinity VHT+ anti-pNP IgG mAbs are considered to reflect the positive selection of high affinity B cells that occurred in GC (1, 2). Therefore, M53, whose Ag specificity is shifted to pNP with the same mutations, may have also been subjected to positive selection. It has been shown using lymphotoxin-α-deficient mice that affinity maturation occurred without GC, although with reduced efficiency (41). The occurrence of IgM Abs such as M53 implies that a part of hypermutation/positive selection can occur at the IgM level. IgM mAbs that were isolated from pNP-CGG-immunized QM mice almost exclusively bore VHT+ IgH, whereas ∼40% of high affinity anti-pNP IgG mAbs used endogenous VH genes. Because one JH locus is disrupted, endogenous VH genes found in the VHT− IgG Abs may have been generated by the replacement of VH in the VHT segment with upstream VH or VH-D segments, as reported previously (22, 36, 42). The apparent absence of VHT− IgM clones in immunized mice implicates that these were very minor in an early stage of the immune response probably due to low frequency of the precursor cells, but expanded drastically during GC reactions through competition with an enormous number of VHT+ B cells. In a B cell line, LK35.2 expressing BCR specific for hen egg lysozyme, it has been shown that BCR-mediated triggering by mutant Ags with varying affinity, as assessed by Ag presentation to a T cell hybridoma, required a Ka value higher than ∼106 M−1. The minimal concentration of an Ag that is required to trigger a response decreased as the affinity increased (43). The parallelism between the intensity of BCR engagement and B cell activation has also been reported in 3-83 anti-H-2Kk transgenic B cells stimulated with recombinant virus-displayed peptide Ags with low or high affinity for the BCR (44). These findings suggest the strict nature of the selection process depending on the affinity of BCR for an Ag. Recently, dependence of a T cell-independent or a T cell-dependent anti-NP Ab response on BCR affinity for the hapten has been analyzed in two lines of mice that carry targeted VHBI-8 anti-NP IgH genes with low or high affinity for the hapten (45, 46). When these two populations compete with each other in the responses to NP-Ficoll and NP-keyhole limpet hemocyanin, only high affinity B cells were found to respond preferentially, while low affinity B cells could respond significantly if there is no competitor. In the T cell-dependent anti-NP response, high affinity B cells predominantly accumulated in GC (46). Similar observations have been made in mice transgenic for mutated VH 186.2-encoded μ genes that generate BCR with low or high affinity for NP when combined with the λ1-chain (47). Consistent with these results, it has been reported that B cells with a wide variety of affinity for an inducing Ag populated early GC, but high affinity B cells gradually dominated during the course of an immune response (48). Affinity maturation has not been fully analyzed in mice carrying a targeted Ab gene. QM mice are considered to be advantageous for analyzing selection and differentiation of B cells during an Ab response in that B cell repertoire is more limited due to the lack of κ genes, and that isotype switching and somatic mutation occur normally. In contrast, it may be argued that the situation in QM mice is unphysiological due to the abnormally high frequency of specific B cells. One of the experimental designs to avoid the unphysiological situation may be to use an adoptive transfer system. We immunized C57BL/6 mice (IgMb) that were injected with 2 × 106 QM B cells (IgMa) with pNP-CGG or NP-CGG. NP-CGG with higher affinity for QM B cells than pNP-CGG induced IgMa response in these mice. In contrast, while anti-pNP IgMb Abs were induced by pNP-CGG, the production of IgMa was negligible (H. Ohmori et al., manuscript in preparation). Thus, the transferred QM B cells with lower affinity for pNP are considered to be outcompeted by high affinity B cells of the host, suggesting that the adoptive transfer system is not advantageous in this case. In contrast, immunization of intact QM mice with pNP-CGG resulted in the induction of IgM production predominantly from VHT+ B cells. Besides the extremely high frequency of VHT/λ B cells (∼80% of total B cells), this may be due to a lower level of competitor B cells in QM mice, because the VHT− B cell diversity may be considerably limited due to disruption of the JH locus on one allele and both κ loci (22). As we reported previously, in (QM × C57BL/6)F1 mice (VHT/germline, κ+/κ−, λ+/λ+) that have 4–7% VHT/λ B cells and more diverse VHT− B cell repertoire than QM mice, VHT− B cells were preferentially activated by pNP-CGG (25). These are consistent with recent reports describing that even very low affinity B cells are activated by an Ag when relieved of competition from higher affinity B cells (46, 47). Despite some disadvantages relating to the unusual B cell repertoire, the anti-pNP Ab response in intact QM mice is likely to obey normal regulatory mechanisms, as follows: 1) The time course of the anti-pNP Ab response, IgG class switching, and GC formation (our unpublished observation) were normal in QM mice compared with wild-type mice. 2) The frequency of VHT+ IgM-secreting B cells after immunization (less than 0.1% in the draining LN cells) was comparable to that observed in wild-type mice. 3) pNP-CGG-induced IgM-secreting plasma cells were derived from VHT/λ1 or VHT/λ2 B cells, and a majority of VHT+ anti-pNP IgG Abs were the products of VHT/λ2 B cells, which were found to bear a common point mutation in CDR3, contributing to affinity maturation toward pNP. Thus, it is suggested that VHT+ B cells were activated in response to pNP-CGG and recruited to GC, in which mutated B cells were normally selected on the basis of the affinity for pNP. In addition, when QM mice were immunized with viral Ags (49) or SRBC (50) that were irrelevant to NP, VHT− B cells were exclusively involved in these Ag-specific Ab responses. We also confirmed that pNP-CGG, but not CGG without haptens, induced VHT+ Abs in QM B cells that were cultured with CGG-specific Th2 clone (Fig. 2⇑C). These data suggest that VHT+ B cells in QM mice are normally subjected to affinity-dependent clonal selection. Although pNP is a low affinity hapten for QM B cells, especially for VHT/λ1 B cells (Figs. 2⇑ and 7⇑), pNP-CGG used is considered to have enough affinity for triggering QM B cells because both VHT/λ1 and VHT/λ2 IgM Abs were produced in the anti-pNP Ab response. The apparent absence of λ1+ anti-pNP IgG may be the result of competition between the two B cell populations with differential affinity for pNP that occurred in the early phase of the immune response. Although the detailed mechanism remains to be elucidated, weak signals via VHT/λ1 BCR are sufficient for inducing IgM Ab responses, but may not satisfy the requirements for the recruitment to affinity maturation pathway. By using NP analogs of varying affinity, the QM system will provide an excellent means to investigate how BCR signal intensity regulates B cell selection and the subsequent differentiation. We thank Dr. T. Imanishi-Kari (Tufts University, Boston, MA) and Dr. B. Diamond (Albert Einstein College of Medicine, New York, NY) for generously providing the anti-Id mAb, R2.438, and the myeloma cell line, NSObcl-2, respectively. Technical assistance of H. Egusa in generating CGG-specific Th2 clones is greatly acknowledged. ↵1 This work was supported by grants-in-aid from the Ministry of Education, Science, and Culture of Japan to H.O. (13037024 and 12450334) and N.K. (12750704). M.C. was supported by a grant from the National Institutes of Health (AI 48602). ↵2 Current address: Institute for Liver Research, Kansai Medical University, Moriguchi 570-8506, Japan. ↵4 Abbreviations used in this paper: GC, germinal center; BCR, B cell Ag receptor; β-Gal, β-galactosidase; CDR, complementarity-determining region; CGG, chicken γ-globulin; CHO, Chinese hamster ovary; LN, lymph node; NIP, 4-hydroxy-5-iodo-3-nitrophenylacetyl; NP, 4-hydroxy-3-nitrophenylacetyl; pNP, p-nitrophenylacetyl; QM, quasi-monoclonal; sIgM, surface IgM.